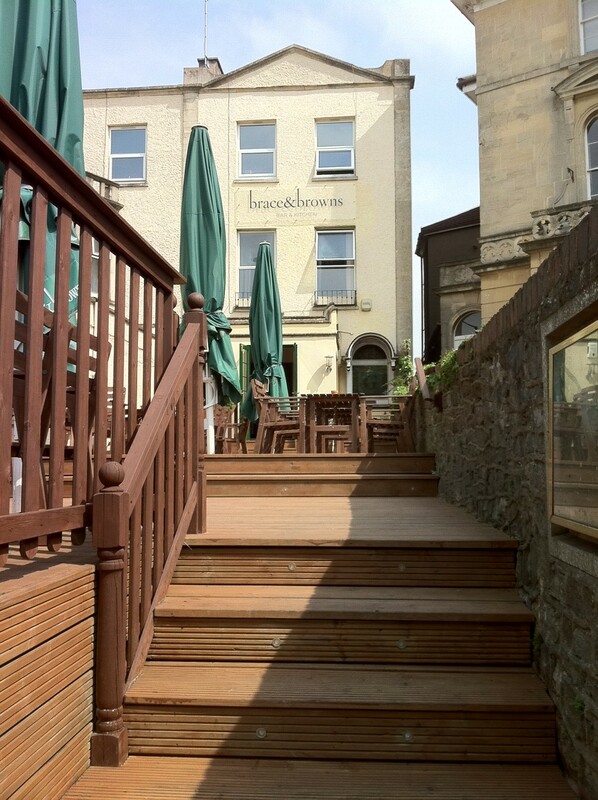 The venue formerly known as Deasons (and most recently used in Raymond Blanc’s “The Restaurant”) has been given a complete overhaul: it’s a smart yet relaxed bar with comfortable seating, wooden floors, a very well-stocked bar and a fantastic decked terrace area at the front. Let’s just hope we have a decent summer! …but we’d been planning on the tapas menu, so the rest will have to wait till another time! Tapas dishes are very reasonably priced: one for £3, three for £8, 4 for £10 or all 29 for £60. We’d been told that if we were hungry, we should go for four each…as I’d only had a salad for lunch (and spent the day whinging about it on Twitter!) that sounded like a plan. It was pretty tough to choose just four dishes each, but we got there in the end. 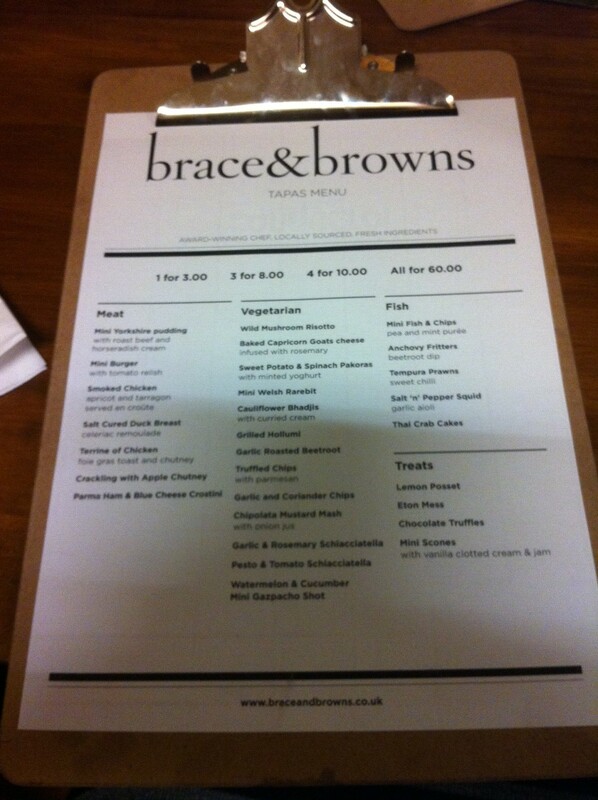 Laura chose exclusively from the “meat” section of the menu – the top board in the picture below. From top left, her board featured the terrine of chicken, salt cured duck breast, Parma ham and blue cheese crostini and the mini Yorkshire. 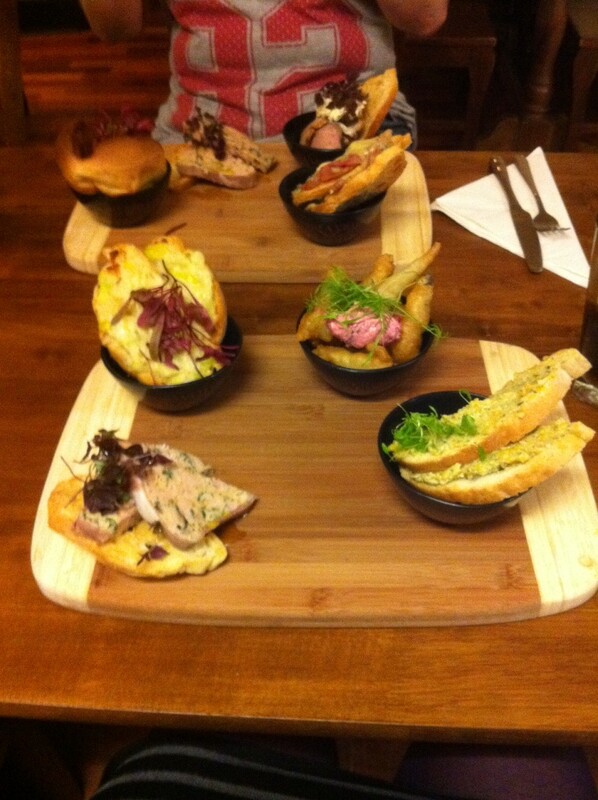 I also went for the terrine (bottom left of the bottom board) as well as, going clockwise, the mini Welsh rarebit, anchovy fritters and smoked chicken. Portion sizes are more than enough for one hungry person – I think next time I go back I’ll avoid having so many bread-based options! I was very happy with what I chose, though. The chicken terrine was velvety and rich, the saltiness of the anchovy fritters was balanced out by the beetroot dip with with they were served, and the cheese on the rarebit was melted over lovely soft strips of leek. I did enjoy the smoked chicken with tarragon (tarragon appears to be used a lot on the tapas menu!) and apricots, which was blended into a pate-type consistency, but a little disappointed that it was served on toasted bread rather than en croute as the menu stated. Laura enthused especially about her mini Yorkshire pudding – the roast beef with which it was filled was lovely and pink and “butter-like” in consistency. It was the same Ashdale Farm beef that is served as part of their Sunday roast menu – something else that I’m keen to try. Choose from 21 day matured prime roasted rib of beef, organic pork belly or leg of lamb, supreme of chicken or nut roast, all served with a Yorkshire pudding(!) and a wide selection of vegetables. 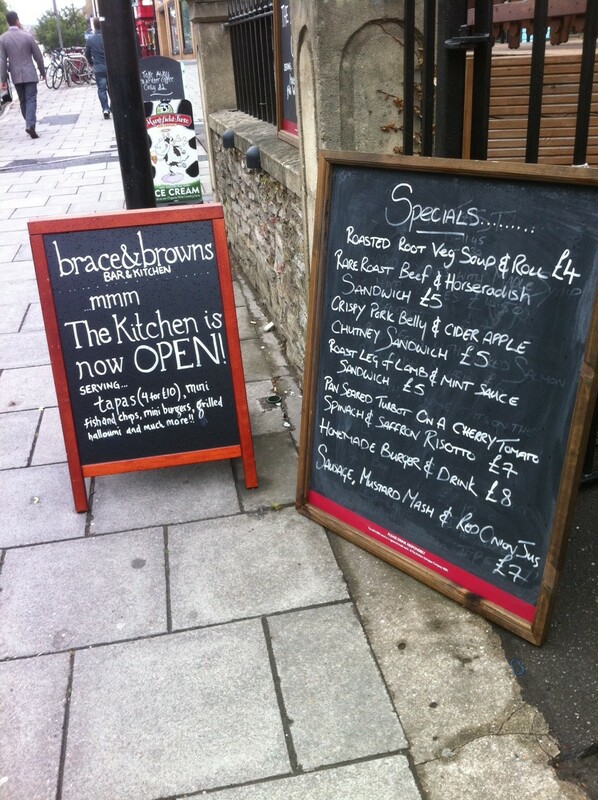 At £12.50 it’s not the cheapest roast dinner you’ll find in Bristol, but I’ve heard great things already. And if you book for the last Sunday of the month, you’ll be able to toss a coin at the bar for your chance to get your Sunday lunch free…more details on their Facebook page! Sorry to hear that – what was the problem? This place is first class – I've had the best Sunday Roast bar none. The array of well cooked vegetables was something to behold. Picture perfect presentation. We returned to have tapas the other day and once again it we were wowed! Staff were attentive and friendly. Their Sunday roast vegetable selections really are fantastic. I've not been for a while – return visit certainly needed!